The mayhem and indiscriminate violence that define Syria’s civil war could not crush their entrepreneurial spirit: yet for some Syrian-Armenian refugees, the shakedown practices that are part of Armenia’s economic environment are more than they can bear. Multiple Syrian-Armenian newcomers who started new ventures in Armenia in recent months complain that the hassles they encounter on a regular basis are so bad, they are considering seeking a new country to call home. Armenian government representatives, eager to see Diaspora Armenians return to their ancestral homeland, are downplaying problems. Yet, in interviews with EurasiaNet.org, 12 Syrian-Armenian refugees from Syria’s largest city, Aleppo, offered a laundry list of complaints about doing business in Armenia: the alleged use of physical attacks and threats by customers when differences arise; the need for family or personal connections; the 20-percent Value Added Tax, and a lack of economic “prospects,” were among the many problems cited. Twenty-four-year-old Krist Brutian lost vision in his left eye after a brutal beating on December 28, 2013, in his family’s Yerevan auto-parts store. The beating reportedly came at the hands of disgruntled customers wielding iron bars. A disagreement over the price for spare car parts caused the incident. They came with 30 people carrying iron bars and said nothing but ‘Kill them!’” Brutian recounted. His 60-year-old father, Armenak, and brother, Manuk, were badly injured as well. Seven individuals were charged, but the case was dropped after the two sides supposedly reconciled. Since 2012, according to Armenia’s Ministry of Diaspora, some 16,000 Syrian-Armenians have arrived in Armenia as refugees. To welcome them, officials have promised help with finding jobs, apartments, food and low-cost business loans. Michel Sarkoian, another auto-parts storeowner from Aleppo, says he is surprised by “the morals and manners common in Armenia.” He claimed that locals in the village of Ptghunk, 11 kilometers outside of Yerevan, where his store is located, have demanded that he give expensive parts for free to so-called “good fellows,” the term used for followers of thieves-in-law, or organized-crime groups. After he refused the demands, he said, threats at gunpoint began. One customer, after not receiving a refund for an item Sarkoian alleges was not purchased at his store, returned with a friend carrying a sub-machine gun “and then tried to run me over with his car,” Sarkoian alleged. “We’ve escaped gunfire and shootings to find shelter in Armenia and now they are threatening us here,” he complained. The police are investigating. The main issue, he said, is employment. 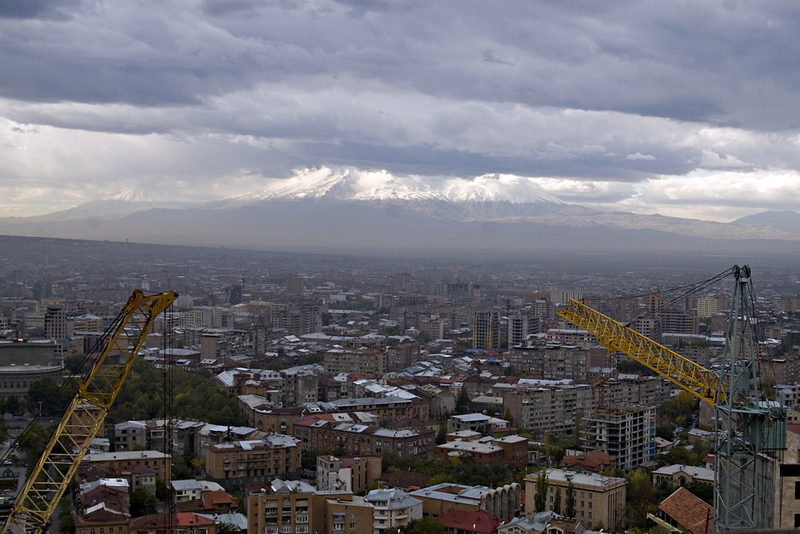 Armenia’s official unemployment rate stands at 16 percent, but is estimated to be much higher. With an average monthly salary of just 160,000 drams ($386.6), most Armenians rely on remittances from friends and family abroad to make ends meet. Tamar Yeranosian, another Aleppo native whose freight-weighing business there was destroyed during the war, claims that high rents and taxes (20-percent on income and sales, among others) have forced him to close two businesses in Yerevan since 2012. “At first, we opened a restaurant here, but closed it six months later and opened a children’s apparel store. We failed to profit from these businesses, as after paying fees and taxes we were left empty-handed, and we don’t know how we are going to live now," Yeranosian said. In response, the government simply stresses its support for the refugees. Ironically, in its 2014 ranking of the ease of doing business in 189 countries, the World Bank ranked Armenia above France, noting improvements for both paying taxes and starting a business. Many Syrian-Armenians link their business difficulties to their status as outsiders. Locals in this predominantly Christian country often confuse them with Muslim Iranians, and refuse rental agreements or other business transactions because of these erroneous assumptions, community members claim. With one-third of Armenia’s population living in poverty, the fact that “many Syrian-Armenians have much better living conditions … also causes anger among locals,” Haroian said. Iranian-Armenians and other Diaspora groups have complained of similar problems. Marianna Grigoryan is a freelance reporter based in Yerevan and editor of MediaLab.am. Why Has Tehran Allowed Russian Bombers to Use an Iranian Base?